Mount Shasta at Bunny Flat. 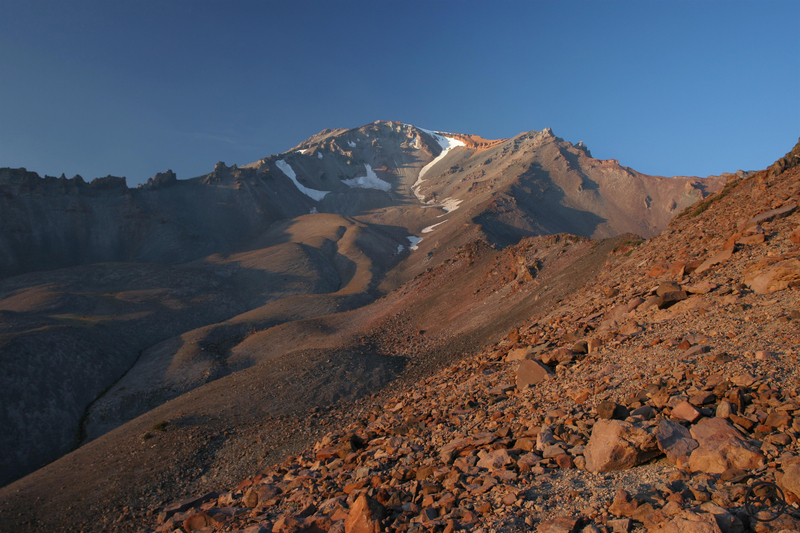 Of the nine hiking trails on Mount Shasta, five of them begin on the Everitt Memorial Highway, the only paved road that climbs the giant volcano. The highway climbs high enough to reach just below treeline at the Old Ski Bowl. As documented here, three of the trails set out from this area. The other two trails begin at a site called Bunny Flat, which is 3 miles before the road’s end and 900 feet lower. With great views to the south and the immense bulk of Mount Shasta towering overhead, it is an exceptionally scenic location. The great scenery is not limited to the trailhead at Bunny Flat. The Horse Camp and Green Butte Ridge Trails, climb up the mountain from the trailhead and explore extremely scenic areas on the volcano. The Horse Camp Trail leads to the Shasta Alpine Lodge, which is owned by the Sierra Club. From there, several destinations await, including beautifully barren Hidden Valley. In contrast, the Green Butte Ridge Trail is a straight-forward ascent up a ridge to its namesake butte. 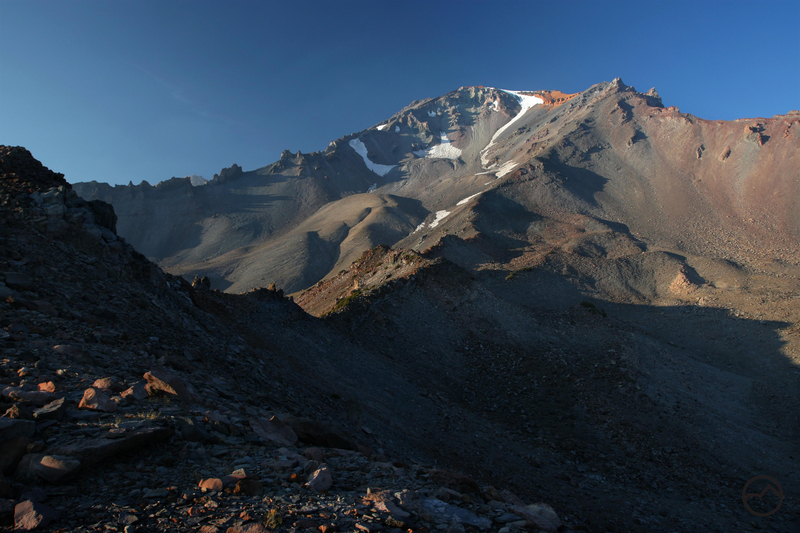 Interestingly, these are possibly the best and least-known trails on Mount Shasta. Despite how many people may or may not use the trails, both are worthy hikes that access tremendous scenery. Mount Shasta glows above Green Butte Ridge. 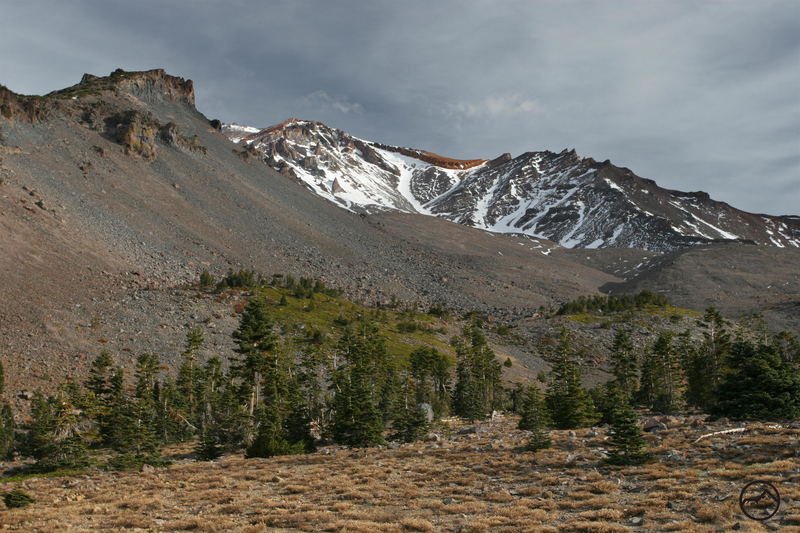 One great feature of the two trails setting out from Bunny Flat is the opportunity to combine them into a fantastic loop through Mount Shasta’s epic high country. The loop’s destination is the summit of Green Butte, one of the five color-themed buttes that surround the mountain (the others being Black, Red, Gray and Yellow Buttes). Though the Green Butte Ridge Trail is a straight, steady ascent of the ridge that leads to the butte, the Horse Camp Trail can also be used to access the peak. For those interested in making the loop, it is advisable to make the ascent via the Horse Camp Trail and then descend via the Green Butte Ridge Trail. This means that the extremely pleasant and scenic hiking through Avalanche Gulch is enjoyed earlier in the journey. The grade is also more moderate as it is stretched out over greater distance. 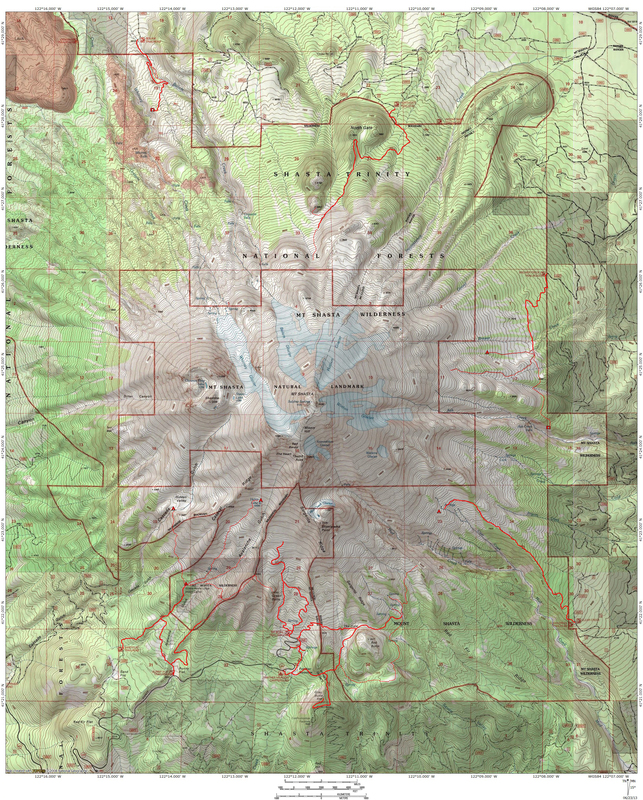 The steep ascent of Green Butte Ridge is reversed and is much more manageable as a descent. 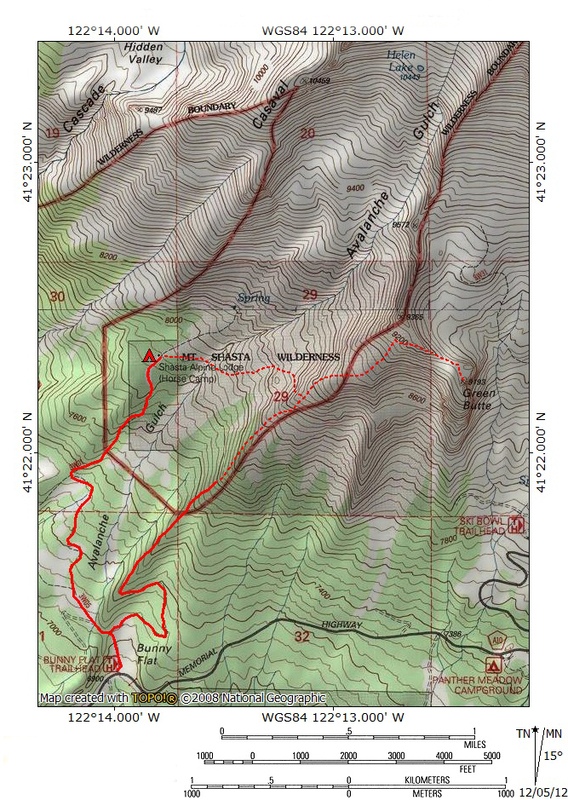 Of course, it must be noted that much of this loop, especially the connecting scramble from Avalanche Gulch to Green Butte Ridge is cross country and should only be attempted by those prepared to meet the challenges. Looking toward the summit from Avalanche Gulch. Alpenglow on Mount Shasta, from Green Butte Ridge. Hey, great stuff! You don’t mention total distance, however. What would be the total miles doing the loop via Horse Camp? And what is the mileage for doing an out and back to Green Butte via the other trail to the right shown? Is it possible to do as a day hike for moderate to strong hikers? Thanks for this-we may do this in mid Oct if the weather cooperates. Also, are the pics in this post representative of the snow on the mountain now? Thanks, Bubba! The mileage for the loop is about 5 miles. It is not too difficult. The hardest part is the route finding up the side of Avalanche Gulch up to Green Butte Ridge. If you find the right route, it is pretty easy. The loop really is a great trip. As far as the images go, none of them are recent. The snow is really, really low now, though. I would not be surprised if there was practically nothing in the gulch by October. Of course, it could snow by then too. Feel free to drop me a line for conditions updates if you like! OK, thanks for the reply, and I will do that! Love that you include a map, thanks! 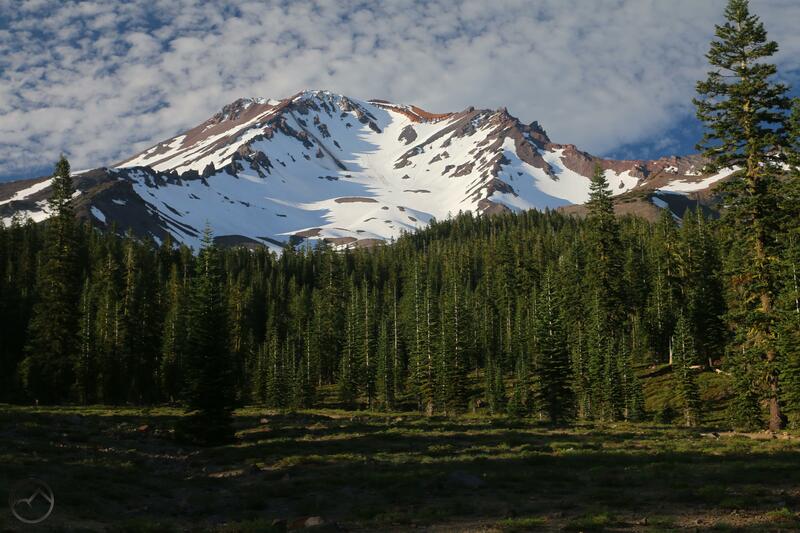 I’ve climbed Mt Shasta via the green Banks trail 5 times, always in July or August. Never have I seen it so free of snow as it is in your photos. I recall once getting out of our vehicle and putting on my crampons in the parking area. It was bare when I took the images and it is pretty bare now. I took the shots of Green Butte Ridge last year at the end of September. Since it was a light year, it was no surprise that there was little snow. That was not atypical for a year like that. Now though, and at this time of year, that is another matter. We need some snow! The trail quickly fades away 1/4 of mile past the horse camp. This loop is not visible anymore. We attempted it today.